Is anyone familiar with this make of machine? I have an appointment to look at one tomorrow morning. The lady I spoke with said it belonged to her late neighbor, and they are asking $100.00 for it. Should be interesting. There is a company in Germany that is currently selling lathes under that name. These lathes will cost you more than a house..(just kidding)..but I understand they are very well made. The company has been around a long time and it would be good to know how old the machine is and what features it has before a value could be guessed at. Should be real interesting. Would love to have a Weiler tool room lathe. $100.00?? They make super precision stuff comprable to any one eleses, like the H or the S brands. yes a nice machine. I have had a few over the years, worth good money to someone. Only `Weiler` is hardly enough info. What model is this one , judging by price alone maybe an old and worn Matador , or one of the older types. There was and still is a german firm called Weiler. At this point, the only information I have is that it is a small belt drive machine. From what I've been able to scare up doing a web search, this leads me to believe that it may be comparable to a Hardinge modelmakers lathe. I'm looking forward to tomorrow morning, this will be fun. D.Thomas- don't go getting my hopes up! Thanks for the link! We got a Weiler Matador at The Bureau of Standards in about 1969 or 1970. As I have said in other posts, by that time in my apprenticeship I had become tired of the Hardinge HLV-H's we had all over the place. I just Loved the Weiler. It is about the same overall size as the Hardinge but it has more power and capacity. It is super well made and fun to run. Our machine came with the DIN spindle nose. It is somewhat like a camlock but instead of pins, the chuck has bolts sticking out of the back. Behind the spindle nose is a ring with "keyholes"
To take a chuck off, the bolts are loostened and the keyhole ring is indexed so the nuts and washers can pass through. Putting on is the reverse of taking off. How can anyone go wrong for $100.00???? Well, I bought the machine. It hadn't been properly stored, and it looks a mess, but I think there's gold under the grime. 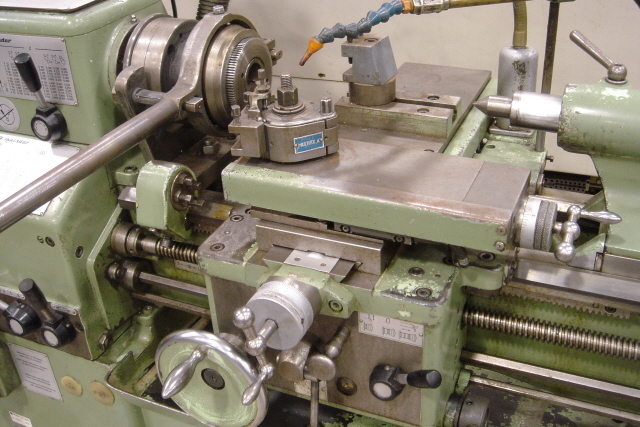 It is simular to a Hardinge DV Five-Nine model shop lathe, and is equipped with a lever operated collet closer. With the machine I got the original three jaw chuck with two sets of jaws, a tool post, various wrenches, and a toolpost grinder that appears to be homemade. Unfortunately, the tailstock is missing, but it looks as if it would be a fairly simple job to adapt one from another machine to fit this one. All in all, not bad for $100.00! Good deal. For what it's worth, it may never have had a tailstock, but had a turret. So if the lathe was in a situation where there is junk scattered everwhere, such that tailstock or turret might be found if you look hard enough, keep that turret "visual" in your mind as a possiblity. D.Thomas- the late lathe owner's estate was in some disarray, and the woman I dealt with said she would call me if she came across anything resembling a tailstock (I drew her a sketch to go by). Bob Itnyre- I'd love to post a picture, unfortunately, I'm between digital cameras. My wife dropped ours recently, and it took a pretty good knock on concrete, scrambling it's "brains". I'm hoping to get another in the near future. I've also got Weiler brochures from the mid 1950's on the LD 250 and LZ 280 toolroom lathes. but with a stand simular to the machine in the image you posted, which by the way, thanks for posting it. I'd have been weeping too, if I passed up that nice little turret lathe for $200.00! I'm new to the forum , bought my first lathe Weiler LZ300 . I would like to start cutting threads , any helpful tips you can give eg setting up machine etc. You may want to get really good at practicing getting a good surface finish on a variety of materials. learn how to adjust to problems. Cut a piece of stock up to a shoulder and stop consistently right up close. Cutting threads is not a place to start. Utube videos may give you some direction. There is a good book printed by South Bend Lathe. Normally you should start your own new thread when adding a new subject. It works better for future searches being specific. Weiler lathes are superb machines. They are top of the line in their class, but I would never own one. The reason is simple, everything for this machine is proprietary and must come from Weiler. There are not many out there, especially in the Americas. Parts and accessories are very expensive and rarely found in the used market, even in Germany.